After spending many years as a scientist (biologist/chemist) in several different Biotech/Pharma companies in the Boston area, Daniel and his wife Marissa decided to move to the beautiful Pacific Northwest and start a new chapter in their lives. Mostly by chance they discovered Whidbey Island and fell in love with it: "Whidbey Island has a way of capturing all your senses and fuels your soul and spirit!" 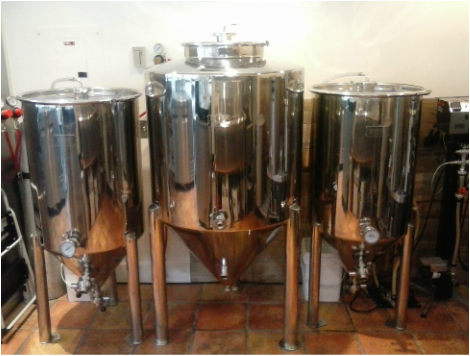 A homebrewer for nearly 20 years, this new adventure is really a dream come true for Daniel. Brewing beer starts with ordering ingredients. We strive to obtain quality ingredients from the Pacific Northwest which is easy given that Washington State is one of the top growers of hops in the world. The majority of our malts come from Great Western which sources grains from Washington, Oregon and Idaho. For some of our European Ales, we sometimes get hops from the country where the beer style originates. This allows us to achieve authentic taste profiles. Our main storage area is this cool, red steel rack. This rack is rated for 4000 lbs. and can hold almost an entire shipment. Here we store all of the base malts and some malts that we use frequently (e.g. wheat malt, munich malt). Most of the specialty malts are stored in an upstairs loft area in grain bins. All in all we have about 20 different types of malt that we use regularly. When we're ready to brew a batch of beer, we weigh out the ingredients (usually between 1 and 6 different kinds of malt) and crush the kernels in the grain mill. 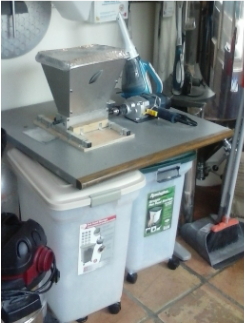 Typically, we use between 80 and 100 lbs of grain for a 40-gallon batch. It is critical to have just the right amount of crush. After sparging, boiling, adding hops and a few other steps and additions, the wort is chilled and transferred to a fermenter. 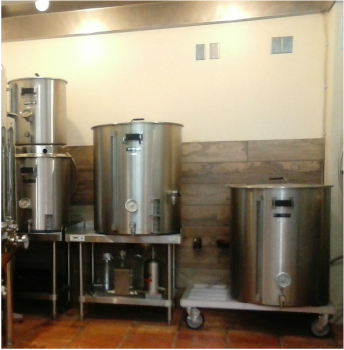 We currently have four fermenters, three 55-gal and one 125-gal. After aeration, the yeast is added and the beer ferments for 2-3 weeks, converting the sugar into alcohol and carbon dioxide.